Daimler CEO Zetsche said that "economic risks have increased dramatically – barely two years after the last economic and financial crisis." 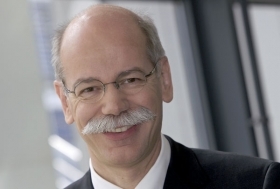 STUTTGART - Daimler CEO Dieter Zetsche is optimistic about 2012 despite looming challenges. "We are in good shape – and we are growing!" Zetsche said in a year-end letter to employees obtained by Automotive News Europe. The CEO also used the letter to warn him team of pending troubles. "It's also true that economic risks have increased dramatically – barely two years after the last economic and financial crisis." Zetsche mentioned the sovereign debt crisis in Europe and the economic situation in the United States. "Will the eurozone get the debt crisis under control? Will the U.S. economy pick up? No one knows the answers just yet. So we need to plan for multiple scenarios – and we are doing so. Our goal is clear: to achieve steady growth in a volatile environment," wrote Zetsche. The aim of Daimler's so-called "Mercedes-Benz 2020" plan is to push the premium brand to No. 1 in the luxury segment in unit sales, revenue and operating profit by 2020 or sooner. In 2012, Mercedes will launch six new models ranging from the SL roadster to the third-generation A-class entry-premium model to the full-electric Smart ForTwo. Other keys to next year will be the launch of a new family of Actros commercial vehicles and the start of a new truck joint venture in China with Foton. Zetsche concluded the letter by saying that there is "no danger of year one after our 125th anniversary being boring. In fact, we have every opportunity to make it the start of another successful chapter in Daimler's history!"